This past weekend’s Maryland Million program at Laurel Park highlighted yet again why Great Notion has to be considered the best sire in Maryland at the moment. Great Notion’s offspring collected three victories on the card, including one exacta finish and another race in which his runners finished first and third. This trio of wins boosted his previous total of nine Maryland Million wins to twelve, and moved him into fourth-place all-time in that category, behind Not For Love (36), Allen’s Prospect (22), and Two Punch (13). Given that the 18-year-old Great Notion covered his largest books to date of 87 mares in 2017 and 75 mares in 2018, it seems unwise to bet against him ending up no worse than second on that list before he is through. Crabcakes, a 4-year-old filly, repeated in the Maryland Million Distaff going 7 furlongs on dirt as the $0.40/1 favorite. Lewisfield, a 4-year-old gelding, won the 6-furlong Maryland Million Sprint geared down by almost nine lengths as the $0.20/1 favorite. Talk Show Man, an 8-year-old gelding, took the Maryland Million Turf at a mile on the grass — his second victory in the race, following a triumph in 2014 as a 4-year-old over the likes of Ben’s Cat. Talk Show Man prevailed by a half-length over the Turf favorite, Phlash Phelps, another son of Great Notion who had won the Turf in both 2015 and 2016. Great Notion’s stakes-winning daughter, Anna’s Bandit, was third in the Distaff behind Crabcakes, while his stakes-placed son Scrap Copper was favored in the Nursery for 2-year-olds, but finished off the board after stumbling at the start. Great Notion is a son of the Gone West stallion Elusive Quality (also the sire of one of the hottest young stallions in Kentucky in Quality Road), out of a daughter of European Horse of the Year and champion sprinter Dayjur. He won both of his starts sprinting at 2, then stretched out to win the one mile Southwest Stakes at Oaklawn by nine lengths as a 3-year-old. But his most noteworthy performance came in the G1 King’s Bishop going 7 furlongs at Saratoga later that summer, when he blazed the way through a :43 half-mile split before winding up second, beaten in a photo and finishing ahead of eventual Horse of the Year Ghostzapper. While he transmits plenty of speed to his offspring — he has two Graded stakes-winning sprinters to his credit in Havelock and Ruby Notion (the latter recently pre-entered for this year’s G1 Breeders’ Cup Turf Sprint) — Great Notion has also proven more than capable of getting quality horses at longer distances as well, with Havelock having won a Grade 3 at a mile, and the likes of Talk Show Man, Phlash Phelps, Jazzy Idea, Great Soul, Our Epiphany, and 2018 Weber City Miss Stakes winner Goodonehoney all achieving stakes victories going a mile or longer. Nor are the Great Notion get limited as to surface — witness his Maryland Million Day results this year, which are indicative of his record on the whole: of his nineteen stakes winners, twelve won dirt stakes, two won turf stakes, three won stakes on both turf and dirt, one was a stakes winner on turf and all-weather, and the final one was a stakes winner on dirt and all-weather. Although Great Notion’s 2018 Maryland Million victories all came with older horses, he has two winners to his credit of each of the Lassie and the Nursery for 2-year-olds, among his seven career juvenile stakes winners. Great Notion’s foals have achieved their success with a variety of broodmare sires. 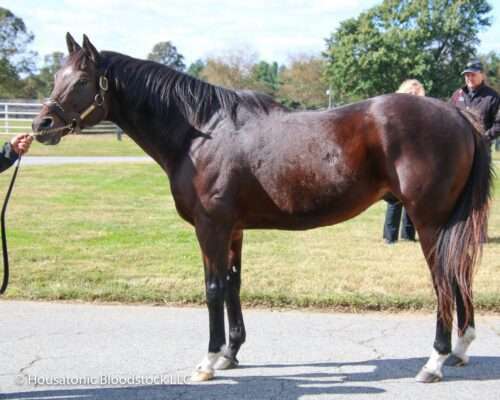 In fact, the only stallion who has sired more than one dam of Great Notion’s stakes winners is Not For Love, who appears as the broodmare sire of four (Haymaker shows up as the broodmare sire of two of Great Notion’s stakes winners, but those are full-brothers out of the same mare). Not For Love is a son of Mr. Prospector (to whom Great Notion is already inbred 3×4 himself), and Haymaker is by Mr. Prospector’s son Two Punch, who also sired Two Smart, the broodmare sire of another Great Notion stakes winner. Three other Great Notion stakes winners have dams by Mr. Prospector-line stallions, one being his grandson Tenpins (by Smart Strike), another by his grandson Fortunate Prospect (by Northern Prospect), and the third by No Armistice (by Unbridled, a Mr. Prospector grandson via Fappiano). Great Notion’s two Graded stakes winners are both homebreds for the Silverton Hill Farm which raced Great Notion himself, and both happen to be out of New Zealand-bred mares: Havelock from a dam by Spectacular Love (a son of Spectacular Bid), and Ruby Notion out of a mare by Volksraad (a grandson of Danzig). Given that Great Notion himself is out of a mare by Danzig’s son Dayjur, that means Ruby Notion is inbred 4×4 to Danzig, which is a pattern that has not been successful in general (of the 34,000 foals inbred to Danzig in the third or fourth generations of their pedigrees, only 1.7% are stakes winners, compared to the breed average of 2.7% stakes winners). But Great Notion has bucked this trend, with no fewer than four of his stakes winners inbred to Danzig either 4×3 or 4×4, including one each from a daughters by his sons Langfuhr and Partner’s Hero. Danzig is a son of Northern Dancer (to whom Great Notion is inbred 4×4), whose male-line has produced the dams of three more of Great Notion’s stakes winners — one by his son Dixieland Band, one by Charismatic (a son of Summer Squall, by Storm Bird), and one by Dehere (a son of Deputy Minister, by Vice Regent). The final two stakes winners by Great Notion have dams by Crowd Pleaser (a son of A.P. Indy) and Baederwood (a grandson of Intentionally, by Tentam, which is a line more typically found these days via Intentionally’s grandson Relaunch, by In Reality) — and both of these come from very limited opportunities with mares from such sire-lines. Great Notion’s nineteen career stakes winners so far come from just 330 foals of racing age (including 33 2-year-olds of 2018, of which only nine have started to this point), which is good for 6% stakes winners from foals — an excellent number in this day and age. And his 1.53 Average Earnings Index (AEI) is well above the 1.22 Comparable Index (CI) of his mates, meaning that Great Notion moves his mares way up. The one realm in which Great Notion perhaps leaves something to be desired is in the sales ring, where his progeny have sold for cumulative averages of just $5,145 as weanlings and $19,726 as yearlings. But keeping in mind that he has spent his career as a regional stallion bred to mares with only a 1.22 CI, not to mention that Maryland racing and the Maryland-bred program have only just begun to return to their former glory with a corresponding increase in the commercial value of Maryland-bred runners, the $120,000 price achieved by a Great Notion colt at the 2018 Timonium yearling sale seems more indicative of the value of Great Notion’s offspring going forward. At the end of the day, though, no matter what they sell for, Great Notion’s offspring have already proven that they can run — which is really all that matters.